2018 Human Origins Conference. Tickets on Sale Now! Open Call for Vendors. Who are we? Where did we come from? Where are we going? What is the true history of the human race? Hosted by Richard and Linda Smith, the Human Origins Conference is an annual event revealing the fascinating realms of Earth’s cosmology, human origins, ancient history and lost wisdom. The conference carries a mission of sharing knowledge with the purpose of expanding the consciousness of humanity by presenting world-renowned researchers, writers and visionaries revealing such sensitive information. This annual conference represents a serious approach to sensitive issues while remaining dedicated to providing hidden knowledge on various topics that profoundly affect us all, topics rarely addressed at all by our controlled mainstream media. Sonia Barrett, George J. Haas, Norris Francis Branham, R. Ken Johnston, Sr., Karen Christine Patrick, Bret Colin Sheppard and Richard Smith. Conference tickets are on sale now and can be purchased through Eventbrite. For more information about the speakers and the conference’s schedule, please visit humanoriginsconference.com today! DEADLINE TO SUBMIT FORM IS AUGUST 15, 2018, UNLESS ALL BOOTHS ARE RENTED BEFORE ABOVE DATE. For more information on being a Vendor or to submit the Vendor Agreement & Application, please visit the CONFERENCE VENDORS & VENDOR INFORMATION page. Click here now. Thank you for your time, interest and consideration. We look forward to hearing from you. Richard and Linda Smith are the directors of the Human Origins Conference which has a prime directive that focuses on getting the word out regarding extraterrestrial intervention, alien contact, the Moorish Legacy and the dynamic scope of our interstellar human origins here on Earth. The prime directive’s mission includes a special focus on economic, social and geopolitical issues affecting Earth’s ecology, spirituality, reincarnation, alien contact, lost knowledge, ancient wisdom, linguistics and etymology, the human condition and current affairs, to name a few. 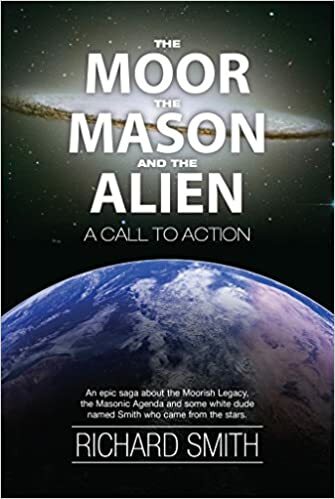 Author Richard Smith has published his newest book, THE MOOR, THE MASON AND THE ALIEN PART II: A VRIL MANIFESTO, the much-anticipated sequel in the author's groundbreaking topical book series, THE VAULTED JOURNALS OF UFOTEACHER. Join the global revolution. Be the spiritual insurrection. Get your copy today at Amazon. Download your free chapter at http://book.ufoteacher.com. A published author of two books, The Moor, The Mason And The Alien: A Call To Action and Legions of Light / Armies of Darkness, Smith is committed to raising conscious awareness in our health and well-being as Caretakers of the Planet as well as creating a better understanding of our place in the Cosmos, both physically and spiritually. He believes that we must focus on the Lost Knowledge of where we come from before we can truly understand the Ancient Wisdom of where we are going on the path of our everyday lives. He carries a dedicated special interest in making the Human Origins Conference an international success in all regions of the global community for future generations while empowering people to realize how important they truly are in this grandest of all adventures known as life. Now available on Amazon, Barnes & Noble, Kindle and Nook. Join the Revolution. Get your copy today!